November 14, 2011 (by Eric L. Palmer) - The F-35 Joint Strike Fighter (JSF) program has some negative issues that must be watched in the coming years. The F-35 program was recertified last year by the then top U.S. Department of Defense (DOD) acquisition official Ashton Carter after its second Nunn-McCurdy cost breach. Besides the effect of looking like a whitewash, there were then and still are, pieces of the puzzle missing. The first was the program's "Milestone-B" that was pulled at the time of the cost breach. This was earned by the program way back in October 2001. Milestone-B is an approval process that gave permission for funding and the start of the system development and demonstration (SDD) phase. Pulling Milestone-B is like removing the permission for a business to operate. In this case; a business that is burning through billions of dollars of taxpayer cash. Essentially today, the permission for the program to continue SDD is done by waiver. There is no Milestone-B. Also missing is a delayed Defense Acquisition Board (DAB) meeting which looks at the deep technical problems and program management competence. It is a critical element that is there to tell Congress that lessons have been learned from problems that caused the Nunn-McCurdy breach. With no DAB, there is no Milestone-B. Aviation Week's Graham Warwick reported on this a year ago in a piece called, "The F-35 DAB that wasn't". The DAB, chaired by USD (ATL) [Ashton Carter], met yesterday to review the JSF program. This DAB was scheduled in June, after the JSF program received its Nunn-McCurdy review and recertification. The purpose of the DAB was to present to Dr. Carter the results to date of the TBR [Technical Baseline Review]conducted by the JSF program's new PEO VADM Venlet, to consider production performance and schedules on the production line at Ft. Worth, to review the results of flight testing and software engineering to date, and to address technical issues arising in the program such as structural issues with the STOVL version. This information is being refined and will be the basis for the Department's decisions about what cost and schedule assumptions to make in preparing the FY12 budget. Another DAB will be scheduled at a later date, at which time the resulting program plan will be considered for Milestone B. To this day, the DAB still has not happened. The problem with no DAB or Milestone-B is that Congress cannot have confidence in the program. This has caused low rate initial production (LRIP) batch 4 to look like “peak production” because the pending LRIP-5 contract contains less aircraft. The U.S. Marines have similar problems. They are now ordering Harrier spare parts and airframes from the U.K. This is an effort to keep something resembling a Harrier capability out to 2025. All services have a bad perception and capability issue with the F-35. The program will not see Link-16 and Blue Force Tracker until notional Blocks 4 thru 6. These are two necessary capabilities that allow the F-35 to communicate with troops on the ground and other joint forces. Without Link-16 and Blue Force Tracker, the F-35 has little or no worth to a joint coalition commander. But before that happens, the F-35 has to prove it is even close to being a go-to-war weapon's system. After 10 years of development, the F-35 has not dropped one weapon. Also, software will always be a challenge with the complex F-35. It will have over 3 times the software of an F-22. There have been new negative discoveries in the program while it operates with no Milestone-B. Wing repairs will have to be done to F-35 A and B models already delivered and in different stages of production. This fix has been described as an expensive and time consuming process. The fancy helmet that was supposed to display a spherical view around the aircraft via input from sensors placed around the airframe does not work. An alternate helmet is in the works but it has less capability. And, all of this fancy over-sell of technology depends on the massive amounts of software mentioned above. Worldwide industry is starting to deal with the shock of a significant amount of order cuts in the F-35 program. 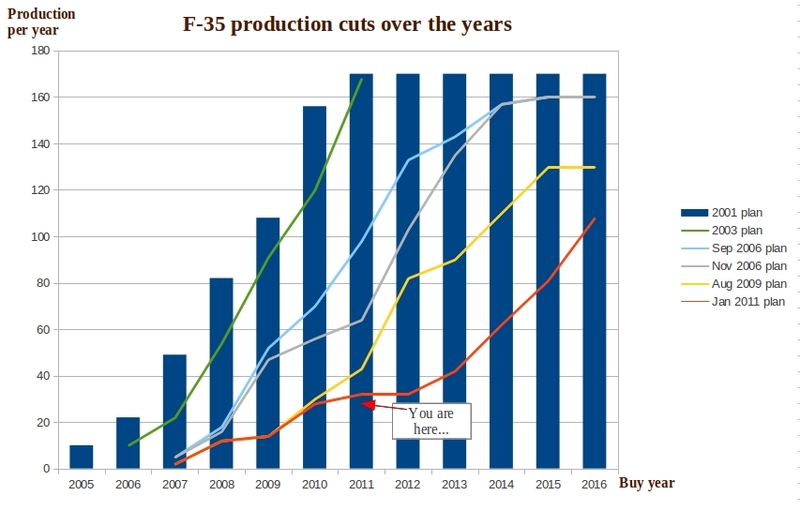 This chart shows how the F-35 procurement plan is ever progressing in negative trends. Just a few months ago, a prized F-35 parts supplier in Australia was forced to close its doors because of lack of F-35 orders. Industry and investors have to take great care to protect themselves from the loss of revenue from being associated with the F-35 program. One can look at the overly optimistic briefings from years ago pushed on by governments, politicians and rent-seekers and see that this kind of behaviour has caused damage and may continue to do so. In looking at the warning signs of F-35 program health, governments should be considering how to minimise damage to their defense budgets and industries. If they have not done so already, now would be the time. Before it is too late.